RapidRun™ 200-3000 bp DNA Ladder is designed for agarose gel electrophoresis enabling quick size estimation and approximate quantification of double-stranded DNA. The ladder is comprised of 8 individual DNA fragments derived from proprietary plasmid vectors to ensure the bands’ stability, accuracy and clarity: 3000, 2000, 1500, 1000, 800, 600, 400 and 200bp. The 1 Kb band is more intense and serves as a reference band. 6 µL per loading is recommended. The ladder is ready to use format with storage buffer and loading dye (10 mM Tris-HCl (pH 7.6), 0.06% Cresol Red, 0.12% Orange G, 60% glycerol and 60 mM EDTA). Agarose gel electrophoresis analysis shows well-defined bright and sharp bands between 200-3000bp. The DNA concentration is determined by spectrophotometry. 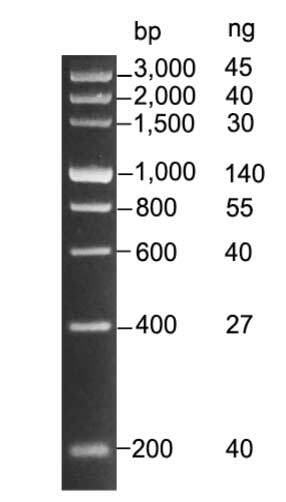 Incubation of 6ul of the RapidRun™ Ladder in restriction enzyme buffer overnight at 37°C shows absence of visible degradation on an ethidium bromide-stained agarose gel. Product is shipped at ambient temperature. Store at -20°C. Product is stable for 1 year at -20°C or 6 months at ambient temperature.